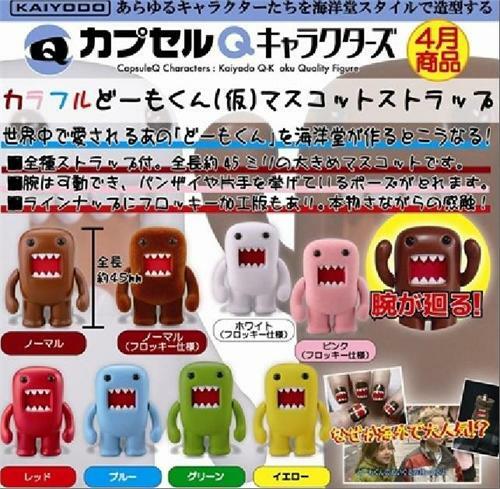 A gang of miniature Domokun are headed to the Japanese marketplace next year, courtesy of Kaiyodo, as part of the company's CapsuleQ Characters lineup of gashapon which is normally sold through turn-of-the-knob dispensers for JPY300 each. 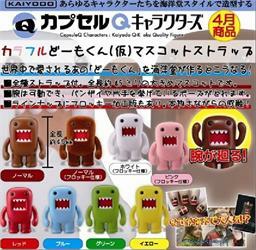 Each Domokun character measures 4.5cm or 1.77" tall and is affixed with a strap for tethering purposes. Reservations for the complete set of eight are welcome to ship in April 2014. When Domokun started out his little cottage- industry-career, he was beloved by many stateside fans even though he only appeared on Japanese television. Eikoh's new Domokun plush features Big Brown in the shape of a perfect cube. Eikoh releases a new set of Domokun plushes. Domokun revisits the toy market with a Revoltech rendition which features 10 points of articulation and an assortment of accessories.